CHINA. Long Whisker Dragon Pattern Dollar Struck in Silver, Year 3 (1911). Tientsin Mint. PCGS SP-63+ Secure Holder.L&M-29; Kann-223a; KM-Pn305; H.Chang-CH28. EXTREMELY RARE. Ordinary obverse with large characters. Missing from most major collections, including the famous collection of Irving Goodman. 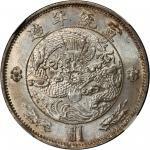 A similar example graded MS-65 by NGC sold for $431,250.00 in our December 2010 auction as part of the Wa She Wong Collection, Lot#27. This example is lightly toned, lustrous and very attractive. Sharp struck, displaying semi-proof like surfaces.<br />PCGS SP-63+ Secure Holder.